The downside to classic old films is, well, that they’re old. There’s a good chance you’ve already seen them, maybe more than once, or at least have heard about them so much that you know their plots, including the “spoilers.” This is especially problematic for mystery thrillers, which rely on you getting surprised by that twist near the end. To keep them entertaining, the trick with such well-worn stories is how they’re told. Case in point: Patrick Barlow’s manic re-imagining of master of suspense Alfred Hitchcock’s classic, “The 39 Steps.” This London and Broadway hit is now playing on the stage of Carmel Community Players in the Clay Terrace shopping center. So, that’s the plot, but even if you know all the answers, it’s still worth both your time and your dime (actually a bit more) to see Barlow’s version, brought to life by central Indiana actors Jay Hemphill, Libbi Lumpkin, Neal Eggeson and Craig Kemp, under the direction of Lori Raffel. The delivery of the story’s scenes rely more on slapstick than suspense, combined with wink-to-the-audience use of stagecraft, where chairs become cars; trunks become trains; curtains and windowshades just hang in midair where needed; and a supporting actor inhabiting two roles slyly converses with himself. Eggeson and Kemp are identified in the program only as “Clown 1” and “Clown 2,” nimbly taking on all the roles of people encountered by our hero, Richard Hannay, played dashingly by Hemphill. Both Clowns bring the funny as they propel the plot forward, including Eggeson’s gender-bending turn as a Scottish inkeeper’s wife, Kemp’s entertaining portrayal of Mr. Memory and the goofy chemistry between them as the thugs in pursuit of our hero. Hemphill plays a Hannay who is at times blusteringly confused as to what is going on, and at other moments a little self-aware that he’s the hero of the play, balancing this dance with our expectations and the fourth wall perfectly. Lumpkin – a fierce balance of beauty, brains and bravery – fills the pumps of both the murder victim and the woman Hannay ends up handcuffed to during one of his escapes. Even at her most irritating and irritated at the other cast members, she never loses her charm with us. Aside from our foursome, credit must also be given to stage manager Mark Peed, whose necessary interventions add to the magic rather than distract. And watch for references to other Hitchcock classics hidden in the story. Another fine feature at CCP is the availability of ice cream at the concessions during these hot summer weekends. “Alfred Hitchcock’s The 39 Steps” plays through Sunday at 14299 Clay Terrace Blvd., Suite 140, Carmel. Call 317-815-9387 or visit carmelplayers.org. Review also in July 30 edition of the Greenfield Daily Reporter. In the last couple of years, people have gotten caught up in the outrageousness of a simple card game. Folks who wouldn’t otherwise bother with bringing out a game box at a party, who left card games like rummy or Uno behind with their childhood, found themselves eager to be both amused and shocked by Cards Against Humanity. The concept is easy to grasp. Players all draw from a deck of cards that each have a person, place or thing named on it. One player, who is the “judge” for that round, draws and reveals a single card from a deck of cards printed with phrases with fill-in-the-blanks. The other players each give the judge a card (face down) that might fit the topic card. The judge then decides which player gave the best or most amusing answer, and the next round is played with a new judge. As the title “Cards Against Humanity” suggests, many cards, which include sexual and scatological references, are as disturbing as they are funny. “Crappy Birthday” declares the rotating judge to be the birthday boy or girl, and the single set of cards are potential bad presents, of which the receiver must pick the worst. Since one person’s get-that-away-from-me is another’s I-want-that-now, the game now has a “Happy Birthday” variant. “Snake Oil” has the judge drawing a card that is his or her persona – a cheerleader, undertaker, or Santa Claus, for example – and the others use their cards to come up with innovations they need to sell. The anonymity factor is taken out, but if a group are good enough friends, hopefully one won’t be too guilty of playing favorites. “The Big Bang Theory Party Game” includes quotes and odd things said on the hit sitcom, played out in Apples to Apples style. No actual knowledge of the show is necessary; this is not a trivia game. The game mechanics add a “Bazinga!” card that changes the goal card that everyone played their cards to match, and also adds scoring chips that allow the second-, third- and fourth-best answers to also get points, rather than just choosing only one winner each round. These are just a few of the variations. Note that none of the three above or CAH (either version) are by the same company that produces Apples to Apples. 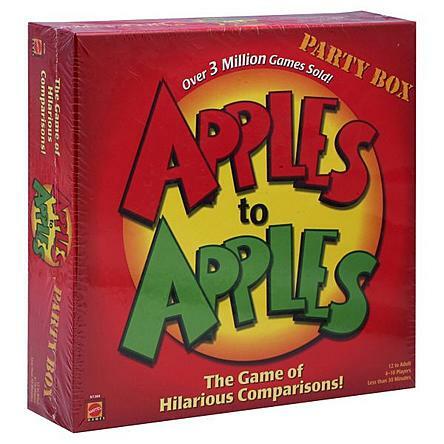 Personally, I’d recommend getting the big “apple crate” version of the original game to get yourself and your friends hooked. Then, try the others. If your tastes and friends are like “R”-rated movies, go for CAH. Perhaps pick up the Big Bang version, and use its scoring chips to make Apples more interesting. Only one warning: These games get so addictive, your party guests might lose all track of time until every card in the box is exhausted. You better get extra snacks. No, it’s not Christmas season already (though watch for decorations at the stores in a month or so), for folks like us who enjoy plays and playing games, August provides a bursting cornucopia of fun. This week, starting Wednesday (today, if you’re reading this on July 29) is the GenCon Game Fair, the world’s largest convention devoted to games, those who play them and those who make them. More than 60,000 happy nerds will overrun downtown Indianapolis, centering on the Indiana Convention Center, though many activities will be in nearby hotels and Union Station. If you are unfamiliar or don’t have much money to throw at this extravaganza, there is discount admission on Sunday, for Family Day (though the whole event is family-friendly). Another note: The hallways of the convention center and hotel lobbies are open to the public. So, if you want to see and (respectfully) admire the many costumes attendees will be wearing, that doesn’t have to cost you a thing. However, the eye candy – while it makes good TV footage – is only a small fraction of the scene. If you like board, card, strategy or party games at all, you really need to get into this convention. 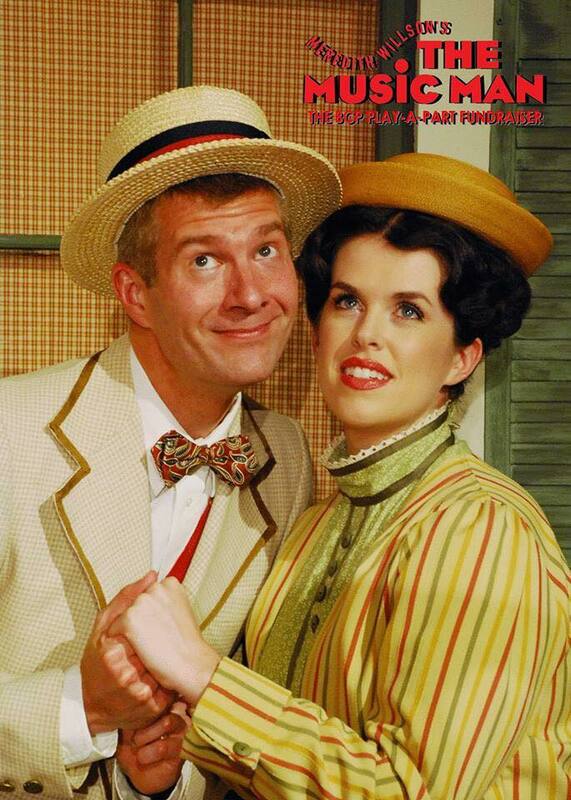 As for plays opening this weekend, we highly recommend fun of a different sort: The Buck Creek Players Play-A-Part Fundraiser production of “The Music Man.” The roles were all cast by winning a silent auction, with no requirements of age, gender, experience or even talent. Fortunately, director Scott Robinson levels the playing field by making the show an anything-can-happen live comedy in the tradition of TV’s classic “The Carol Burnett Show.” The result is highly entertaining, and the funds raised help with building improvements at this all-volunteer community theater. There are just four performances, Friday through Sunday, which are likely to sell out. Hit up the website or call 317-862-2270. Sunday sees the return of the monthly experience that is “Going, Going, Gone” at Theatre on the Square. Co-creator Lou Harry has announced that, in honor of GenCon, the items bid on (which audience members get to win and keep) will be nerd-themed, as will be the cast, led by ubernerd (and Angel Burlesque MC) Jeff Angel. Also, wear a GenCon badge to the show, and get extra play money to bid with. Go, Go, Go, and quick, before the seats are gone! 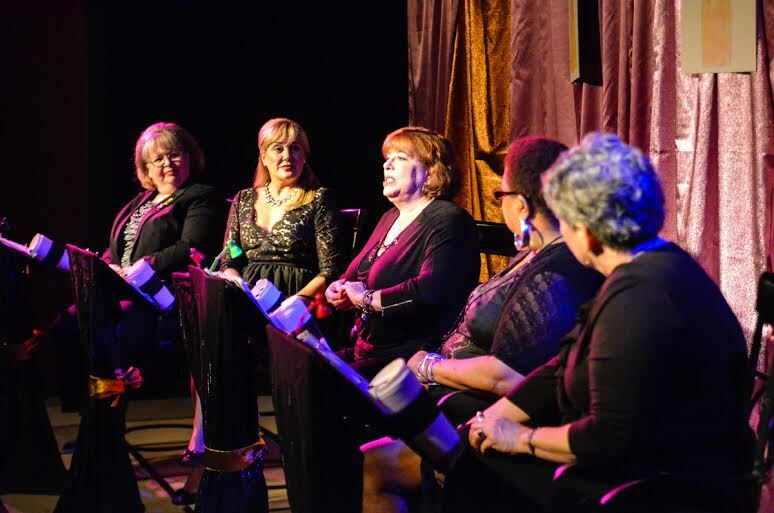 For regular patrons of Beef & Boards Dinner Theatre in northwest Indianapolis, just saying, “There’s a ‘Smoke on the Mountain’ show!” is enough to get many scrambling to contact the box office. The popular original off-Broadway show centers on a gospel-singing family putting on a “sing” at a rural North Carolina church in the 1930s. Aside from seeing the interpersonal drama among the Sanders clan and sharing a few laughs, the audience is treated to a series of old-time hymns and gospel tunes, with the cast playing an array of instruments. The sequel, “Sanders Family Christmas,” has the family returning to Mount Pleasant Baptist Church for a holiday sing in 1941, the last show before the Sanders’ son goes off to war. The present production, “Smoke on the Mountain: Homecoming,” takes place in late 1945, with the war over and young Dennis (Will Boyajian) back with the family, following through on his service as a chaplain and a lifelong call to take the pulpit as the Mount Pleasant minister. The departing pastor, the Rev. Mervin Oglethorpe (John Vessels), responded to a request to open a church in Texas and will leave the next day, taking his very pregnant wife, June (Sarah Hund), the Sanderses’ elder daughter. Burl and Vera Sanders (Bob Payne and Pam Pendleton) still have daughter Denise (Christina Rose Rahn), Dennis’ fraternal twin, now married with twins of her own, as well as Burl’s troubled brother, Stanley Sanders (Brian Gunter). They are hosting one more sing before the Oglethorpes depart, but it becomes apparent that there are still a few issues to work out. It helps that most of the cast is the same as past B&B “Smoke on the Mountain” productions, especially Vessels as the emotional and hyperactive Brother Mervin and Hund at her comic best as simple June, who provides the family band’s percussion, sometimes in hilariously inventive ways, and signs rather than sings — though some of her gestures might confuse any deaf audience members who happen by the church. Boyajian and Rahn make their B&B debuts but manage to fit right in as though they had always played the Sanders twins, especially when circumstances force them to re-enact a song from when Dennis and Denise were very young. It’s not all comedy; be prepared for some very serious moments of testimony and a lot of talk about Jesus. But this is what comes naturally in a musical with a song list that looks like one from a small-town Sunday school. In fact, especially when Dennis or Stanley recall their darkest hours, it’s easy to forget that these are fictional characters. 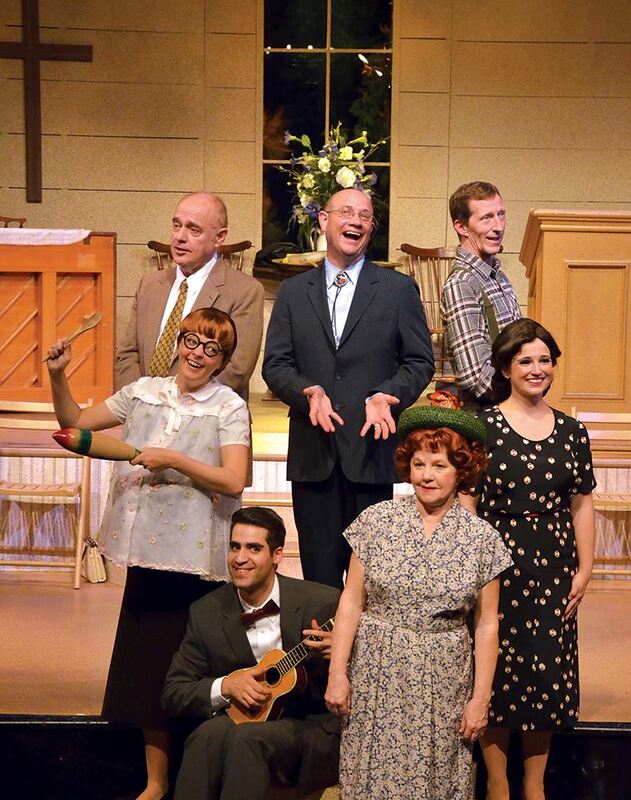 But the spirit (or Spirit, if you believe that way) of the play stays true to the memories of those of us who ever attended a little church in the backwoods -– or a hometown congregation anywhere. One hopes that playwright Connie Ray would eventually see fit to have the Sanderses go see June and Mervin for a Texas-sized gospel sing, but for now we can enjoy witnessing the “Homecoming” daily except Mondays through Aug. 16 at 9301 N. Michigan Road, near the Pyramids. Call 317-872-9664 or see beefandboards.com. Review also appears in the July 23 edition of the Greenfield Daily Reporter. There are two stage openings of note this weekend. 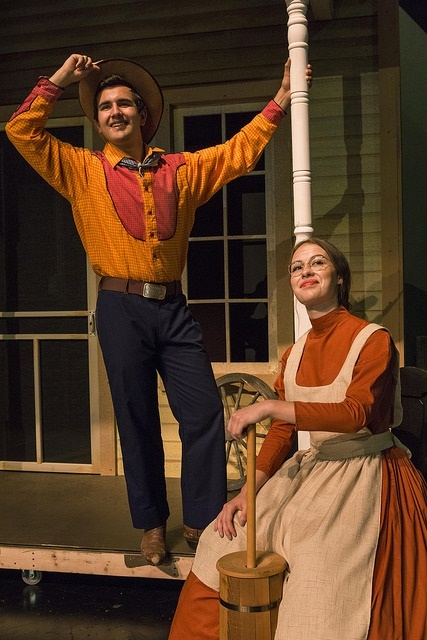 The Rodgers and Hammerstein musical “Oklahoma!” is on the boards at the Booth Tarkington Civic Theatre in The Center for the Performing Arts in downtown Carmel. This is the annual summer production performed mainly by late teen and early 20s actors. Given the youth theatre and high school thespian scene, these “kids” might already have some seasoning, but career- or volunteer-vocation-wise, they are just getting started. Summer brings out local devotees of the immortal Bard (both on stage and in audience) for Shakespeare in the Park. Thursday through Saturday this weekend and next, a production of the comedy “Twelfth Night” will be presented at Seminary Park, located between 10th and 11th streets, and Division and Hannibal streets in Noblesville. Festivities start at 7:30 p.m. and admission is free. For something a little different this weekend (for grown-ups only) the Angel Burlesque “Nerdgasm” returns to Theatre on the Square on Mass Ave. in downtown Indy, Friday and Saturday, starting at 10 p.m. Being geeky has never been sexier. — Go have some fun!